NBC has discovered, as the old joke goes “any day that ends with ‘day’,” that the name of its signature morning news program can be handily used to promote a specific day’s show. 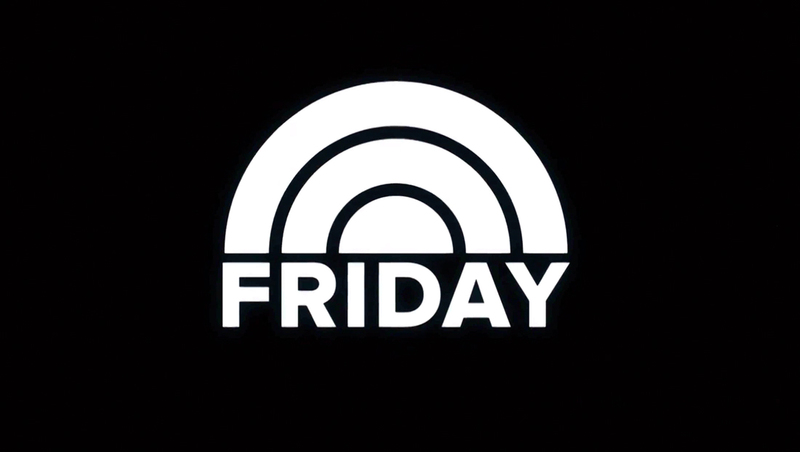 In a spot advertising the Friday, Nov. 30, 2018, edition of the show that began airing earlier in the week, the “Today” sunrise logo is shown above the word “Friday” spelled out in the “Today” font — in the spot normally occupied by the show’s name. The fact the word “Friday” ends in “Today” is not only a clever play on words that’s also used in the casual narration as “Friday on Today,” but also creates visual interplay. The rest of the promo is filled with letterboxed imagery with boxed key words and names, also rendered in the clear typeface Proxima, which is used as both the logotype and throughout the show’s graphics package. Although the topical imagery is shown in color, the rest of the promo sticks with stark black and white, including the opening screen — and the photo of anchors Hoda Kotb and Savannah Guthrie at the end.